January 30th, 2019 by Jordan R.
With the auto market slowly shifting towards vehicles with autonomous function, there are automakers that plan ahead and have a few concepts in the mix. There are also automakers planning for now, not gambling too much on the future and going with what works today. Mitsubishi Motors is in the latter group, and so far, they’re putting out a new model, or announcing a new model, every few months. 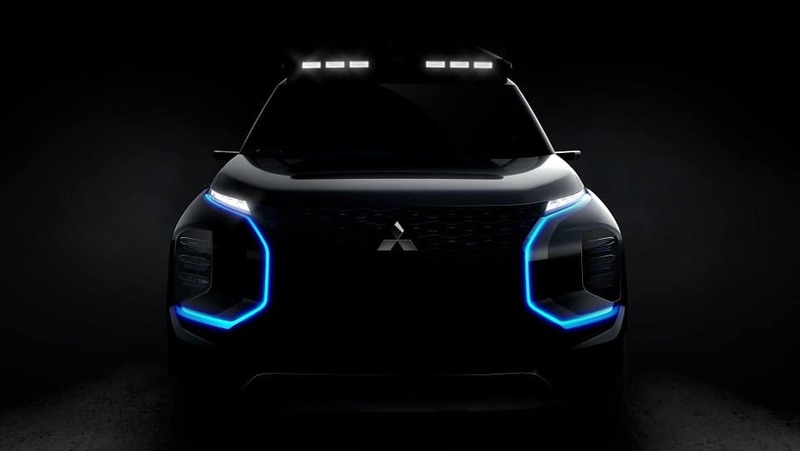 The latest from Mitsubishi Motors is a concept hidden in shadow, teased to debut at the 2019 Geneva Motor Show in Switzerland. Who bought the naming rights to that? It’s hard to fathom what this vehicle could be, with the major characteristic being that it was given its name after the beautiful, rugged Alpine town Swiss ski resort “with a history of sporting success”. The only image out there is the classic mark by Mitsubishi, showing off parts of the front fascia and the lighting. Those curvy blue LEDs are looking slick, and the lights on the roof have our attention. One wonders about those wing-mirror cameras on the side – how futuristic is this concept going to be? Carving its own niche? This makes us wonder if Mitsubishi Motors is planning to form a new car segment. Not too long ago, the automaker said it isn’t giving up on passenger cars, and Mitsubishi has debuted the Mitsubishi e-Evolution in America more than once. Catch that? “In America”. There’s a few interesting concepts, that could favor the American market, that Mitsubishi is holding hostage overseas at the moment. One of these would be a pickup truck. Oddly enough, even after all the teasing Mitsubishi did when marketing the Triton, the 2019 Triton L200 may not make it to the U.S.
“…[that’s the] first question out of every dealer’s mouth whenever I have a meeting” – Mitsubishi Motors North America CEO Fred Diaz told Fox News Autos during an interview. So, the short answer is, probably not. Although the small truck segment is starting to rev up in America, Mitsubishi Motors can’t take any chances just yet. Although it operates as its own entity, separate from the Renault-Nissan-Mitsubishi Alliance, the board may be a little more timid when it comes to taking chances. Crossovers and SUVs are also reigning King for the auto market in the U.S., and Mitsubishi has plenty of those in North America. Even so, the Triton L200 is an off-road capable truck. Enhanced with a four-wheel drive (4WD) system and two off-road systems, “Super-Select 4WD” and “Easy-Select 4WD”, that can handle gravel, mud/snow and sand settings in 4WD-high and -low mode, or rock in 4WD-low. The market for that is growing, so don’t count out the 2019 Mitsubishi Triton just yet. The 2019 Geneva International Motor Show goes on from March 7-17 2019. Mitsubishi Motors has a special website set up for ol’ Engelberg to keep us updated – bit.ly/2Sj5x7S. Join the discussion on University Mitsubishi social media.